There are a couple of important things to note when planning a trip in Norway, the ferry charges more for cars higher than 2 meters and it is actually cheaper to take a small trailer than stack your boats on the roof, this also gives you the extra room to store all your food for the trip. Food in Norway is pretty expensive, so it's best to take most of it with you if you can, petrol is also expensive 85p per litre (diesel about 80p), but you can't do much about that. The best, (well only easily available) guide to paddling in Norway is 'Elvepaddling' and most of the rivers we paddled were in it. Anyway, inspired by thoughts of 24 hour sunlight and stunning Scandinavian women the team set forth with two rented cars, a small trailer, four Topos, a Magic bat, Invader and a Rapidfire from beautiful Tyneside on a sunny Saturday afternoon. We arrived in Bergen at around 9.00 pm on the Sunday and were informed by the cheery customs officer that we must be mad to go canoeing as Norway was having it's worst floods in over 30 years and a party of 8 rafters had drowned the previous week, (cheers mate). Drove out on the E16 towards Voss, dossing by the side of the road about an hour or so out of Bergen. Unlike some European countries dossing is quite permissible in Norway as long as you are 150m from the nearest house and we had no hassles during the whole trip, unlike our previous alps trips. We cooked a meal at about 11.00 pm (still light) and decided as the sky was clear to doss out. We were unceremoniously woken by the patter of rain on exposed sleeping bags at 7 the next morning. Pissed off, we headed for the first river the Strondaelva. After passing through Voss follow the E16 until the river crosses from your right to your left, there is a picnic sight on the left here which is a good point to get out and look at the bit you want to get out before. Another 5km up river the road recrosses the river and this is the get on. When we paddled it (very high water) there was a grade VI stopper 200m after the get on, the rest was III/IV, getting off before the picnic site. Even though all of us had paddled abroad before, we were well surprised by the speed of the Norwegian water and rather subdued after our first river which was supposed to be easy? To get were you need to be in Norway you have to cross over the Sognefjorden (longest fjord in Europe), it's best to do this from Vagsnes to Hella rather than the more obvious Gudvangen, as it is much cheaper, quicker and the route takes in some spectacular mountain top scenery. Once in Hella we headed for Skjolden, taking a left here to Morkri, the get in for our second river. As it was late we followed the road/track through Morkri and on for another 2 Km to the end of the track, which provides a good doss site, tents were put up this time as it had been raining all day. There is a foot bridge here which provides a good seal launch to start the river, which we shot in bright sunshine the next morning. Moving further north east through Lom, Vagamo and Dombas we took in the many spectacular waterfalls (picture above) as we headed for our first Elvepaddling river the Lora, looking at the Jori on the way, which was completely out of its box and death on a stick. Fortunately the Lora has a road which runs next to it all the way to the get in. Unfortunately, the road is a toll road (about 3 quid per car in this case, although it's up to you to put the money in the box) and is actually an unsurfaced track and also is only open after 1st June. A fact we found after paying the toll and driving to a locked gate 1km up the road. There are however, marked camping sites, which as far as we could work out were free. You should get used to these types of unsurfaced roads as most of the smaller roads are like this. Had our second attempt at dossing out, but only managed to get to 6 am before it started raining. Headed out in the pouring rain to try and find the upper and lower Folla between Hjerkin and Adval, neither of which we could find, decided to buy a better map in Adval, 1:350,000 is the smallest map you should consider our original 1:800,000 was crap. Eventually, managed to find the Solna after diving up and down 20km of tracks, however by the time we had got on a mist had started to form over the water which prevented us from seeing more than 50ft so we binned it after a couple of km. Dossed at the top of the Solna (in tents again), and devised a cunning plan to look at several rivers the next day ending up at the Atna. Unfortunately, this was all spoilt by a young police woman (in leather) the next day who informed us that both the possible roads to the Atna were closed due to flooding. So instead we set off east in the rain (again) to find the Mistra, which when we found the gauge was quite a bit higher than the previous recorded maximum in 'Evelpaddling'. Scared by this we chose the easier GIV top section and walked it all first to make sure it was O.K. Paddling it for real later that evening. The next day we went for a second try at the Atna, but the Norse gods were against us and the wheel came off the trailer half way up one pass (picture). The bearing had seized (too much rain and unmade up tracks) and spun the retaining nut off. Managing to recover most of the bearings, we set off to the nearest town in search of a replacement, although everyone was very helpful and all spoke English we still had no luck. Fortunately, one of our team was Bri 'full chat' (ace mechanic) and with the aid a file, most of the roller bearings, some Vaseline and the retaining nut, which Mick had cunningly found after a 4 hour search, we were back on the road again. After getting some real grease later in the trip, this fix was enough to keep the trailer on the road for the rest of the trip. Unfortunately, we didn't get any paddling done that day and ended up in Ringebu, where they didn't have any mains water due to the flooding? The following day we paddled the Vinstra, which we thought would be a safe bet as it was GIII, dam release and only went when there was a lot of water. Well there was a lot of a lot of water and this big bouncy III was a seriously continuous GIV/V, which had us all scared at several points. We dossed that night in a very pretty half flooded picnic site by the side of the Lagen and made plans after our lucky escape on the Vinstra to do the same on the flooded Sjoa tomorrow. 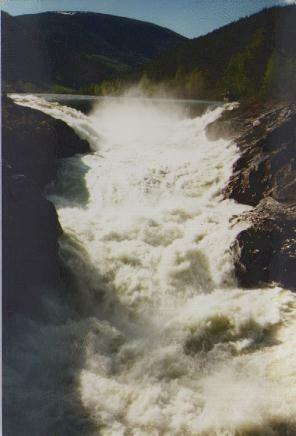 The Sjoa is the main white water paddling river in Norway and even has a slalom site built on it (above a serious GV/VI section?). There are several sections which can be paddled the best of which (apparently) is the Sjoa canyon, although according to some Fins we met it was currently running at a big and very hard GV (so we didn't do it). We did however, get on the Heidel to Faukstad section which was a scary repeat of the Vinstra. Then headed up to look at the upper Sjoa and the Russe before going for a nice paddle/slide on the semi frozen lake Gjende (picture) at the top. As the Soja hadn't dropped at all by the next morning we decide to have our third go at the Atna. Yesss we got there, third time lucky and well worth the wait, the extra water made this river an enjoyable GIII/IV and made the last 3km an nice bumpy GIII rather than the normal GII slog. This river was enjoyed by everyone even Bri who had the only swim of the trip. Following our success on the Atna we dossed at the get in to the Setininga that night and despite its quite full appearance decided to paddle it the next day after a recce of the first 3km. This was probably the best river we paddled, continuous GIII/IV with a couple of portages, tight and technical just the job for the Topos (pictures), although it was Mark in the Rapifire who paddled the serious GV which every one else portaged. Everyone was happy, but hungry and exhausted by the end of this river, maybe worth taking a packed lunch along next time. Back to our doss sight next to the Lagen again that night, and then on for a second attempt at finding the Folla the next day. This time with a better map it was much easier. The Upper Folla is quite open, but a small tight and technical GIII/IV another good topo river, so good in fact we paddled it twice. The Lower Folla has much more volume and is a big GIII with a very nasty GIV/V corner. As it was now well into June we decided to give the Lora another go. The road was open this time and we met a group from Edinburgh Uni half way up, the only other canoeists apart from the Fins that we had seen all trip. Camping here again we drove up to the top of the track to do the top section of the Lora the next morning. The top of the Lora is quite high and very cold and we had to abandon the run after 3km as people could no longer grip their paddles. Ho hum. Over the next couple of days we drove, back to Bergen, paddling the Mokridaselva and Strondaelva again, ending up in Bergen for a Pizza and beer evening on the Saturday before the Sunday ferry sailing. Due to the late thaw and copious amounts of rain when we were there Mosquitos were not a problem however, we are assured that it is normally very hot and sunny at this time of year and bug repellant is a must. All in all it was a very good trip, and both more spectacular and more expensive than the standard Alps trip, but well worth a return visit. 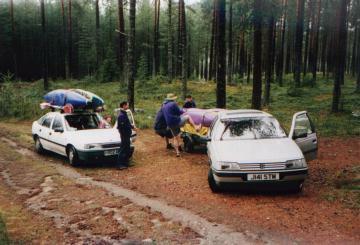 With two rented cars, a borrowed trailer, seven people and taking most of our food with us it cost 467 quid each all in. This was for 4 travelling days and 13 full days in Norway during which we covered approximately 2500 miles. P.S. We would like to thank Will's scout group for lending us their trailer, stoves and tents.